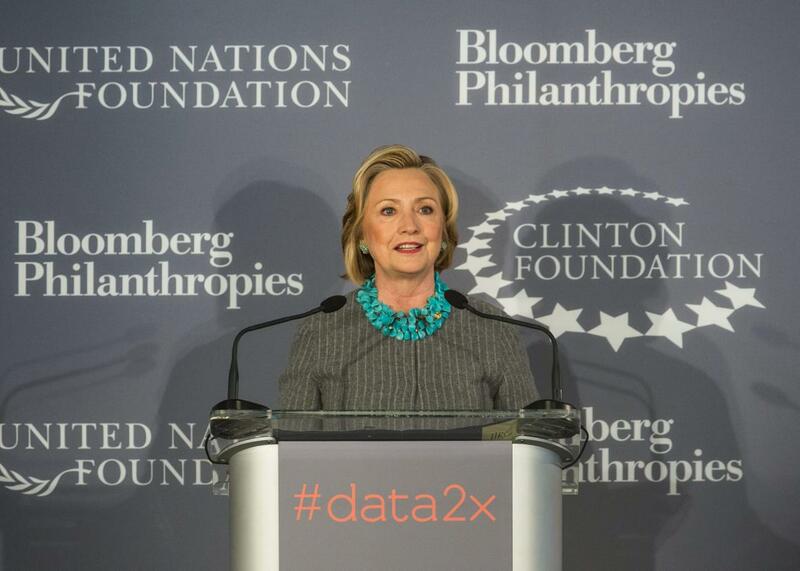 The Clinton Foundation controversy, explained. The Clinton Foundation Saga Is Insanely Convoluted. Here’s Why It Matters. Hillary Clinton speaks at a press conference on Dec. 15, 2014, in New York City. On Tuesday, the Associated Press released a troubling new report suggesting that Hillary Clinton frequently met with the Clinton Foundation’s big-dollar donors in an official capacity during her time as secretary of state. Here is an attempt to unpack the ongoing and convoluted scandal that Republicans have pointed to as a sign that Clinton can’t be trusted in the White House and that Democrats are generally trying to shrug off as no big deal. Hillary is up big in the polls and in accompanying electoral projections, but she’s not in the White House yet—Republicans are hoping that the slow trickle of challenges to her integrity as exemplified by the Clinton Foundation affair will start to bring her numbers back down to Earth. Recently released documents from her time as secretary of state continue to raise serious questions about the Clinton Foundation, its overlapping interests with its deep-pocketed donors around the globe, and how that all may have influenced her work in the State Department. The ongoing controversy poses an immediate political problem for Hillary as she seeks the presidency, and would pose a real-world one for her administration if she does indeed win this fall. Wait—I’ve heard of this “Clinton Foundation” thing. Haven’t we already litigated this scandal? In some ways, yes. The Clinton Foundation has long been a topic of interest for Hillary’s fellow politicos, the press, and the public. In 2009, when then-Sen. Hillary Clinton was being publicly considered for secretary of state, her critics were quick to point to the foundation as one giant web of conflicts of interest. As a result, the foundation agreed to make public a list of its previously confidential donors, which turned out to include a number of oligarchs, royal families, and foreign governments. Those same concerns—along with new ones associated with the millions of dollars Bill and Hillary were personally paid to give speeches to many of the same entities that donated heavily to their charitable organization—returned to the fore last year when it became definitive that Clinton would be running for president. Most notably, the cozy ties between the Clintons and their global patrons were the subject of Clinton Cash, a much-hyped book-length investigation from Peter Schweizer that was released in May 2015. Schweizer is a conservative journalist with ties to Breitbart News’ Steve Bannon, who since has become the chief executive of Donald Trump’s campaign, but that hasn’t prevented the book’s reporting from getting national attention in publications like the New York Times. The book itself failed to find the smoking gun Clinton’s most vociferous critics are convinced exists, but it served as a prod to the rest of the press corps to investigate the issues raised by Hillary’s involvement with the Clinton Foundation. OK, then, why is this in the news again? Recently released email exchanges between Clinton’s aides at the State Department and those working for the Clinton Foundation offered Americans a peek into how the Hillary-led department and the not-for-profit that bears her name interacted while she was serving in the Obama administration. That picture is not a particularly flattering one. In one such exchange from 2009, for instance, Clinton Foundation executive Douglas Band reached out in an attempt to put a Lebanese-Nigerian billionaire, who had donated heavily to the foundation, in touch with one of the State Department’s experts on Lebanon. After top Clinton aide Huma Abedin suggested she’d help make the connection, Band responded by urging Abedin to call the ambassador herself ASAP. “This is very important,” he added. In a separate exchange several days earlier, Band had asked for something his subject line described as “a favor.” The email is heavily redacted, but it appears as though Band was trying to help someone who had recently traveled to Haiti on a Clinton Foundation trip get a job at the State Department. “Important to take care of [redacted],” Band wrote. To which Abedin replied: “We have all had him on our radar” and “Personnel has been sending him options.” A few months later, Band reached out again, this time on behalf of the crown prince of Bahrain, who wanted a last-minute meeting with the secretary. “Good friend of ours,” Band wrote of a prince whose government had given tens of thousands to the Clinton’s charity. The list goes on. Yikes. What else you got? But that doesn’t prove quid pro quo, right? Correct, though that shouldn’t make anyone sleep better at night. You don’t need to believe the Clintons orchestrated some sort of pay-for-play scheme to know that there is something wrong with a dynamic where it is nearly impossible to prove whether they did or did not. Still, what’s so bad about taking a meeting? Don’t politicians meet with donors all the time? Yes, the possibility of favor trading hangs over almost every decision in Washington, where congressmen and presidents attend fundraisers with and play host to their biggest benefactors. But Clinton was—and is—in a unique position because corporations and some foreign entities can donate to her family foundation rather than just her campaign, something they can’t do directly to other candidates. Those conflicts of interest are only compounded, of course, by the fact that she was then the nation’s chief diplomat and is now running to become its chief executive. Even if Hillary were able to separate past foundation donations and the promise of future ones from her official actions, the donors cutting those checks would still be getting the appearance of access to a former president and a likely future one. And the mere perception of access matters, both in the financial marketplace and the political one. But I thought the Clintons stopped accepting donations from companies and foreigners. Nope. Bill Clinton announced last week that the foundation would stop accepting such donations if Hillary wins in November, but not before then. That decision would limit—but not eliminate—the conflicts of interest that would be created by a global foundation founded by the man who was the 42nd president of the United States and the woman who would be the nation’s 45th. While the Clintons are now promising to build that firewall for themselves if Hillary wins the White House, their announcement did nothing to prevent foreign entities or corporations from cutting a check now with the perception that they might cash in later. But is this really more concerning than anything that’s come out of Donald Trump’s mouth in the past 15 minutes? Probably not. But you can still believe Donald Trump would be a far worse president—one with even bigger and more dangerous conflicts of interest—and acknowledge that this is a legitimate issue of concern about Clinton. Trump might be terrible and he might be the one with the most to gain from serious investigations into the Clinton Foundation. But the weight of Bill and Hillary’s combined policy influence means that examining these questions through the lens of a political campaign is an appropriate frame to discuss the conflicts of interest that plague our political system. That discussion becomes only more urgent every step closer the Clintons get to returning to the White House. OK, but the Clinton Foundation does tons of great work, right? You just want to throw that all away? Yes, the Clinton Foundation has done admirable work promoting global health and human rights around the world, and the Clintons, their staff, and their donors should be lauded for that. But that also doesn’t change the fact that as long as Hillary Clinton is either running for the White House or running the country from inside it, donors will likely see the Clinton Foundation as a way to gain influence. If their donors are truly being driven only by altruism—and not by access—there is no reason they wouldn’t find another nonprofit for their charitable contributions during the next four or eight years. When is this all going to go away? Unless Donald Trump pulls off one of the greatest political upsets of all time, or Bill and Hillary find religion on the matter and stop accepting donations immediately, probably not until some time around 2021 when neither Clinton will have any sort of office to run for. Either that, or sometime around President Chelsea Clinton’s second term in the 2040s.